This apartment is located on the top floor with an enchanting view, it is reached by a lovely terraced staircase. There is a lovely private lawn area with chaise lounges and a sun umbrella & gazebo. The second bedroom has three beds, two of which can be adjoined to make a matrimonial or queen size. There is also an antique wardrobe closet in this room and a dresser, night tables with bedside lamps and two windows with shutters . A folding bed is available. "Villa La Pietra Grezza " ( The Raw Stone Villa) is situated in the medieval hamlet of Bisticci, in a panoramic position among the rolling hills of Tuscany, in the Chianti Valdarno area, 18 km far from Florence. 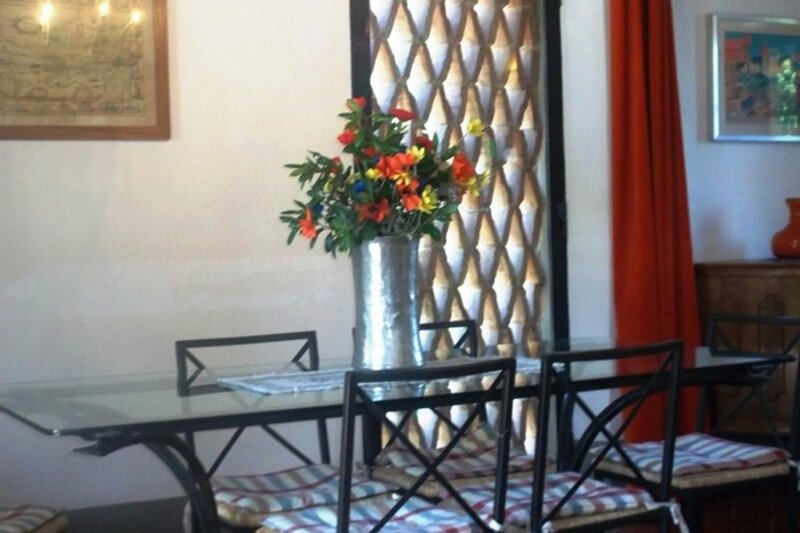 The apartments, in characteristic Tuscan country style, have cotto tile floors, beamed ceilings and are completely furnished with televisions, washing machine, dishwasher, refrigerator with freezer and centralized heating. Internet ADSL wi-fi available. Only 18km from Florence, and a simple drive down the hill to the small village of Cellai, this lovely rural estate consists of a gracious large house divided in two apartments, each with their own private covered area for outdoor dining , surrounded by terra cotta pots of beautiful flowering plants. The apartments are comfortably furnished, with bed linens provided, towels for both kitchen and bath, dish and cooking utensils, vacuum cleaner, ironing board and iron. Cot on request.